I bumped into Nathan Kirsch of Legit Reviews and Jansen Ng of DailyTech while I was picking up my CES badge yesterday. They both had Storage Visions badges. I didn't have one. I felt left out. It got worse when they told me that they just saw Micron's new SSD - the RealSSD C300. Both of them said it looked damn good. I felt extra left out. Then they told me that Kristin Bordner, Micron PR, was looking for me and wanted to give me a drive. Things started looking up. I made the trek over to the Riviera today to meet with Micron and take a look at their RealSSD C300. 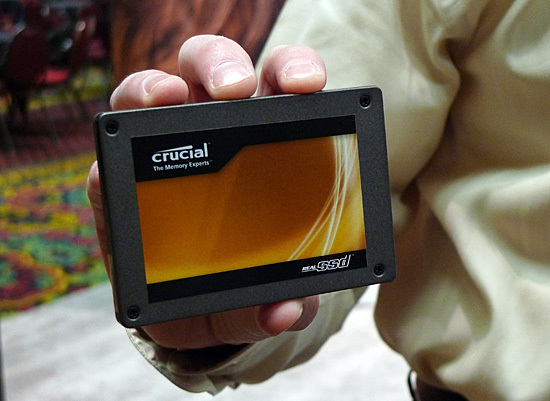 SSDs are difficult enough to evaluate after months of testing. They're basically impossible to gauge from a one hour meeting in a casino ballroom. The C300 is based on a new Marvell controller. 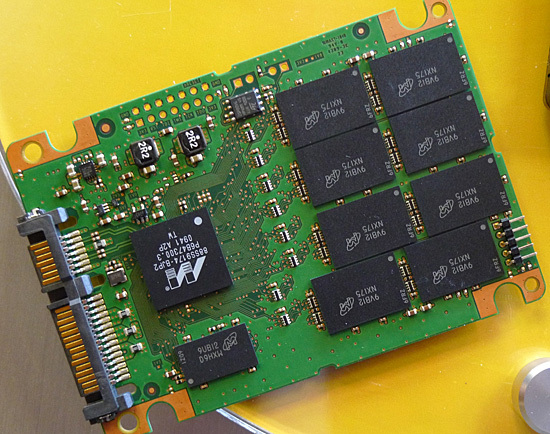 It's the first consumer SSD to natively support 6Gbps SATA. The firmware and all of the write placement algorithms are developed internally by Micron and its team of 40 engineers. Micron tried using Marvell firmware in the past and quickly learned that it resulted in too much of a "HDD-like" experience (ahem, JMicron). The Marvell controller features two ARM9 processor cores that operate in parallel. While they can load balance, one generally handles host requests while the other handles NAND requests. Adjacent to the controller is a massive 256MB DRAM. 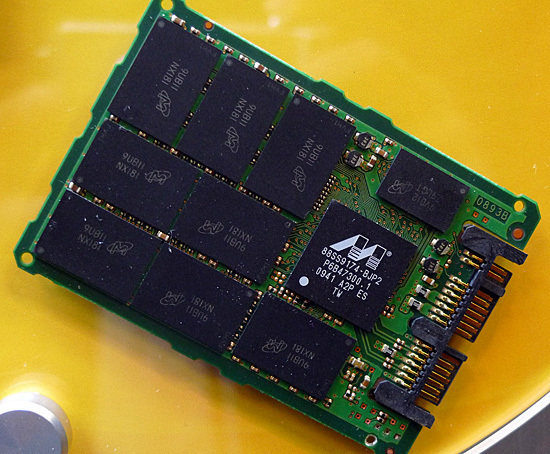 According to Micron, "very little" user data is stored in the DRAM. It's not used as a long term cache, but mostly for write tracking and mapping tables. The controller internally doesn't have much cache on-die. Not nearly as much as Intel, according to Micron. While the original X25-M only had a 512KB SRAM, Micron claims that the latest G2 controller has a 2MB cache on-die. Micron x-rayed the chip to find out. The write placement algorithms are similar in nature to what Intel does. There's no funny SandForce-like technology at work here. Every time a write is performed the controller does a little bit of cleanup to ensure that the drive doesn't get into an unreasonably slow performance state. Unlike Intel however, Micron does do garbage collection while the drive is idle. The idle garbage collection works independently of OS or file system. TRIM is supported but only under Windows 7. There are no software tools to manually TRIM the drive. Micron hopes that its write placement algorithms and idle garbage collection will be enough to keep drive performance high regardless of OS. Supporting 6Gbps SATA isn't enough to drive performance up. 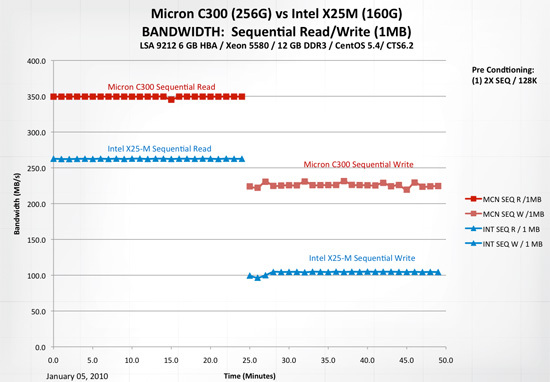 Micron is also using 34nm ONFI 2.1 NAND flash. The combination of faster NAND and a faster interface results in sequential read speeds of as much as 350MB/s. That's a full 100MB/s greater than the SandForce based OCZ Vertex 2 Pro we just previewed. Write speeds don't set any records though. Micron claims the drive will do 215MB/s on sequential writes. 3牛！ 6Gb SAS阵列+16块intel 64G SSD,带.